The resolution now goes to the full Senate, where it has passed five times in the past. The vote was along party lines, with Democrats against. Indiana state law already limits marriage to between one man and one woman, but supporters want the language inserted into the state Constitution so judges can’t overturn the law in the future. 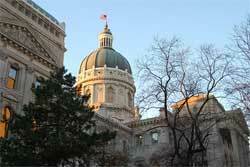 The second sentence effectively would ban legislators from enacting civil unions in the future. The House passed the measure on February 15. The General Assembly would need to pass it again in 2013 or 2014 before it would be sent to the ballot for voters.